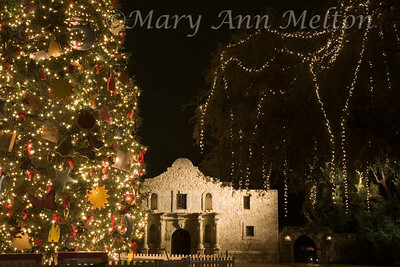 A horizontal photo of the Alamo at Christmas time with a large Christmas tree and the light draped trees from the Riverwalk. 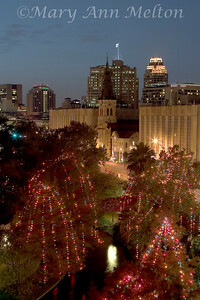 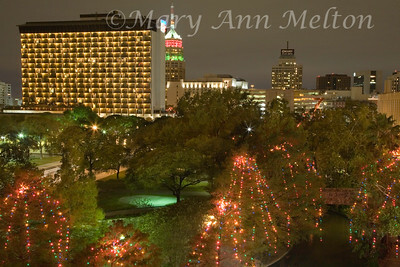 A horizontal photo of the Christmas lights along the San Antonio River Riverwalk processed as High Dynamic Range, HDR, to give details of the trees, lights, and city buildings. 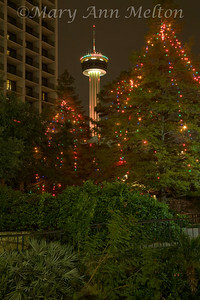 Overlooking the San Antonio RIverwalk from the Marriott Hotel, the lights draped over the bald cypress trees create a Christmas wonderland. 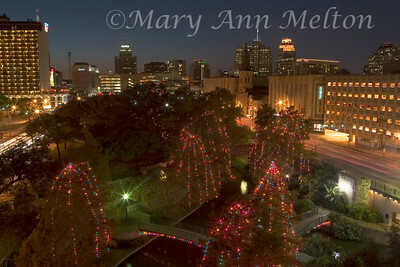 St. Joseph Catholic Church and its manger scene are reminders of the peace and goodwill of the holidays. 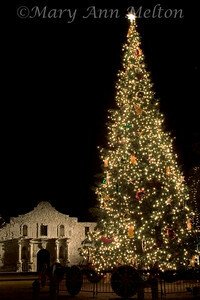 A giant tree lighted by thousands of lights gives Texas' most famous landmark a touch of Christmas spirit.